Demand for foodservice disposables in the US is projected to increase 3.9 percent per year to $21.9 billion in 2019. Packaging will remain the most common product segment and will outpace serviceware, napkins and other foodservice disposables. Retail and vending will be the fastest growing market, while eating and drinking places will remain dominant. 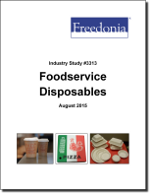 This study analyzes the $18 billion US foodservice disposables industry. It presents historical demand data (2004, 2009 and 2014) and forecasts (2019 and 2024) by product (e.g., packaging, serviceware, napkins) and market (e.g., eating and drinking places, retail and vending, institutional). The study also considers market environment factors, details industry structure, evaluates company market share, and profiles 34 industry players, including Dart Container, Pactiv, and Georgia-Pacific.